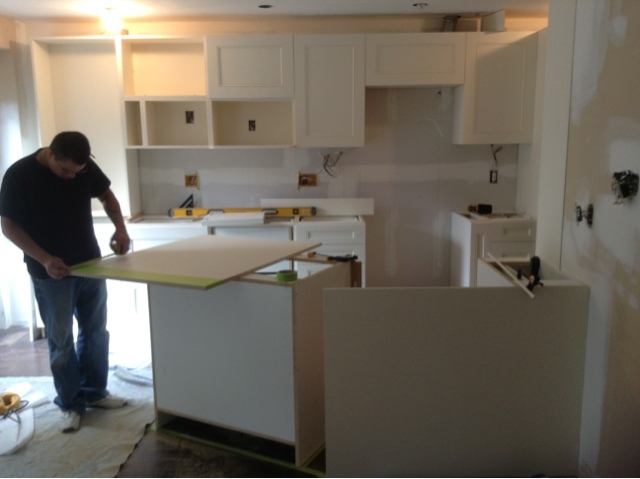 Just Fork It: Kitchen Reno 2013: Days 5-9. Things totally happened! 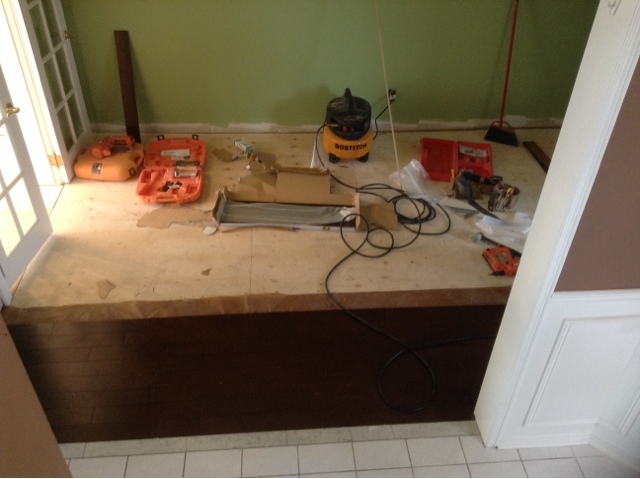 Kitchen Reno 2013: Days 5-9. Things totally happened! Sorry I've been delinquent-- a long weekend will do that to you. But, we did get an extra 1/2 day back on Day 5, since the contractors took responsibility for the keys and locked up for me, and they did make use of their extra time (we thought they'd have to leave when I left for my weekend). 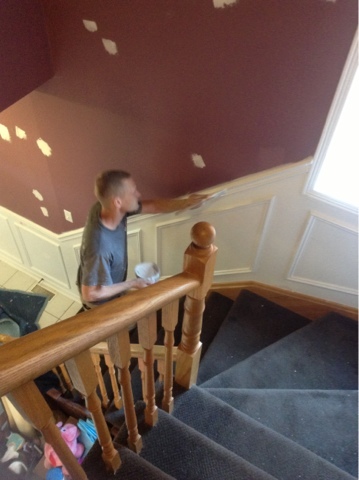 So on Day 5, Jamie-the-painter got 2 coats of brown done on the hallways, including the very high-ceilinged stairwell. Jamie, master painter, at work. Starting the bamboo nail-down flooring. After some initial trouble (the bamboo is something like 6x harder than oak, so they had to adjust their nailing technique, because the nails were bouncing back at them. And they needed new saw blades as well). 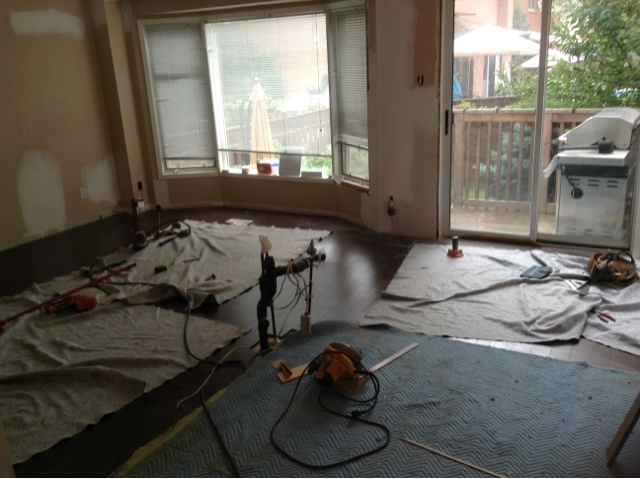 They progressed well on the floors on Tuesday, and also did a bit more sanding and more mudding. 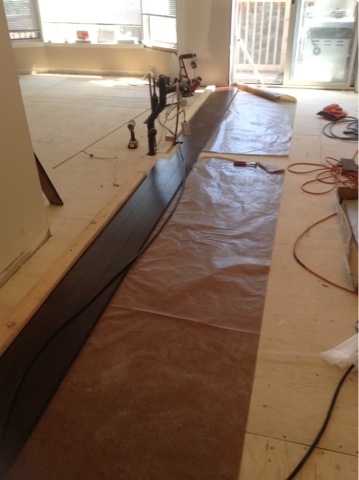 That is one long run of flooring! About 36ft or so. Side note: there is way too much dust produced by sanding the spackle. I will never be dust free, ever again. I know this to be true. 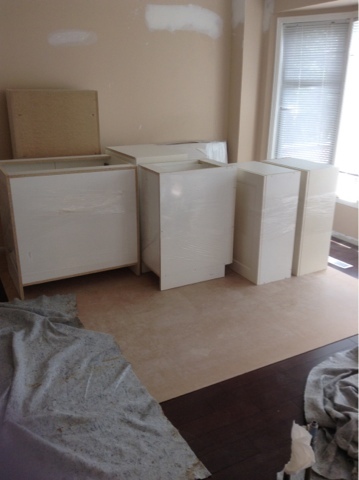 So, Day 7 brought the finishing of the floors-- took till about 1pm, and at 2pm, the cabinets started to arrive! I had hoped they would install them right away, since they were already assembled at the shop, but they just brought them in (about 1/2 the order) and stacked them. Pretty cabinets... but wouldn't they look better on my walls? Day 8 was a Thursday, and the project plan called for the counter template to happen on Friday. 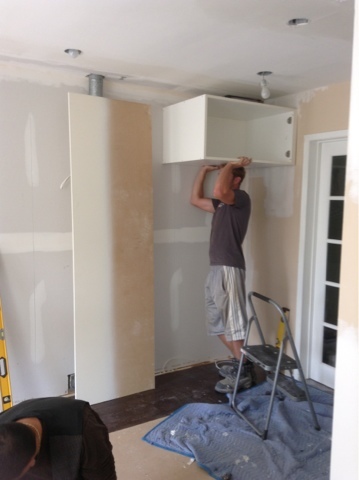 This could be a "show stopper," as we say in the project-management world, so the guys (including Milton, the kitchen designer) worked until about 7pm to get far enough along so that the template guy could come on time on Friday. They got all the wall cabinets up, and mapped the spot for the peninsula. Day 9 - Milestone Friday! If the counters don't get templated today, so they can be built next week, we are screwed. We started the day with a list of questions, such as, can we move the peninsula, the one that you worked about an hour mapping out yesterday? And, this interior hidden drawer that has no pull and is flush to the shelf above it-- how to you foresee me pulling that out? So, Milton was here again around 7:30am, moved the peninsula (well, the tape on the floor, representing the peninsula) out a few inches, which was much much better. I told him and Justin (Joe and Justin are the main partners, one or the other stops by every day) about the drawer issue, and we discussed solutions for that (something about moving it down, back, and installing a grommet? ), so everyone is feeling good about everything again. 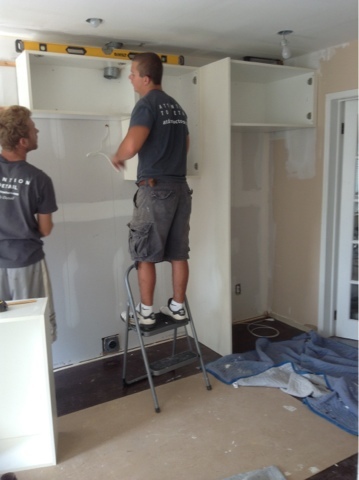 All the cabinets were in place by 11am, and the templater (um, we'll call him Mr. Template) arrived on time. There were arts & crafts performed, involving red tape, cardboard, and a pencil, and lickety-split, he was GONE, Keyser Soze style. The rest of the day was Andrew and Brent finishing putting up the cabinets, crown and baseboards in the dining room, baseboards in the living room, and did a pretty good sweep-up job. We can call Milestone Friday a success. So, what's next? The countertops and backsplash will be built off-site, meanwhile, I will train my company's new hires, and when I return, we resume Day 10. The crown for the living room has to match the cabinets, so that will be sprayed to match at the guys' shop. 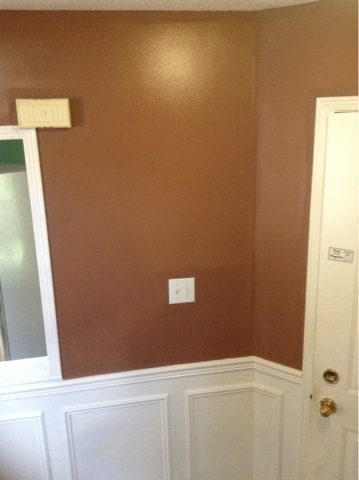 Priming and painting the kitchen, living room, and powder room (and one remaining hole in the dining room, sigh). Appliances will be moved back and hooked up-- we'll need plumbing and electrical for that (gotta love mixing water and electricity. EXCITING). 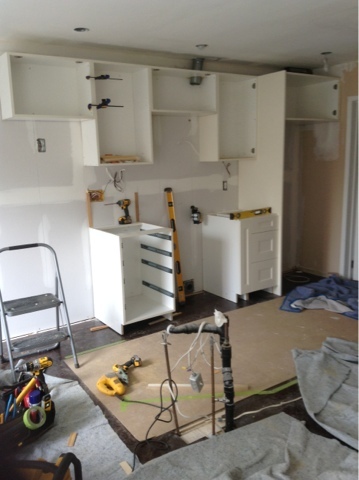 Countertops will come mid-week, final electrical (outlets, switches, pendant lights, fan).